"Costa Concordia in Italy freed from rocks"
Engineering officials in Italy say they have succeeded in lifting the cruise ship Costa Concordia free of rocks, 20 months after it ran aground. Efforts to right the ship, one of the largest and most daunting salvage operations ever undertaken, are continuing through the night. The vessel has been detached from rocks and moved on to a platform constructed on the sea bed, officials said. Thirty-two people died when the ship ran aground off the Tuscan coast. The bodies of two of those killed in the January 2012 disaster, by the island of Giglio, have never been found. There are hopes that they may be located during the operation, although officials said on Monday there was no sign of them so far. Engineers have never tried to lift such a huge ship - over 951 feet long (290m) - so close to land. By Monday evening, the vessel had rotated by 20-21 degrees, the officials said. This means that there is another 44-45 degrees to go before it is upright. However, the officials hope that once it has risen by 24 degrees, the ship will begin righting itself thanks to gravity and to metal boxes attached to the side and filled with water. The start of this huge operation was potentially the most problematic phase, and the stage that worried the engineers the most, says the BBC's Alan Johnston at the scene. But now the ship has been broken away from the reef on which she has been lying, the hope is that it will now be possible to rotate the wreck more easily, he adds. The Italian Civil Protection Authority said the sea and weather conditions had mostly been right for the attempt, but the operation had to be delayed by three hours because of an overnight storm. The storm delayed the positioning of a barge carrying a remote control room close to the shipwreck, from where engineers were using pulleys and counterweights to move the Concordia from the steep underwater incline it is resting on. Sergio Girotto, an engineer working on the project, told reporters on Monday the operation was going smoothly. "Everything is going according to plan, we are following the plan to sequence. There is no problem whatsoever." The ship could be seen emerging from the water as operators worked to hoist it upright. Footage from the scene of the salvage operation clearly shows the watermark on the part of the ship that has been submerged for the past 20 months. More than 50 enormous chains and winches are being used to break the ship - twice as heavy as the Titanic - away from the reef on which it has been lying and roll her up onto her keel. 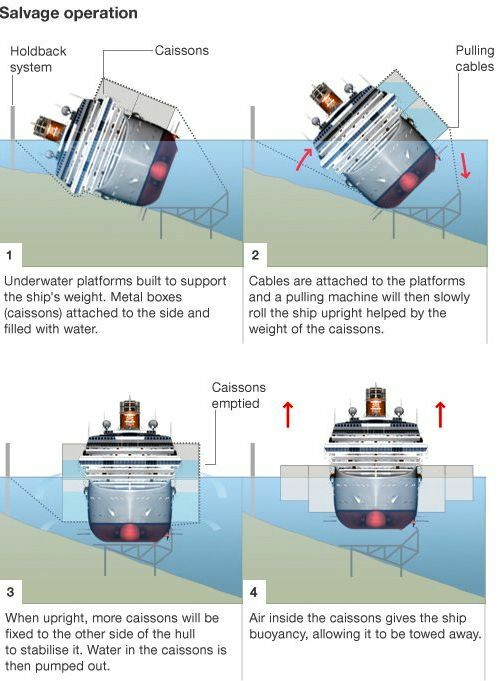 Engineers will try to roll the ship up using the cables and the weight of water contained in huge metal boxes welded to the ship's sides - a process called parbuckling. This procedure must be carried out very slowly to prevent further damage to the hull, which has spent more than 18 months partially submerged in 15 metres (50ft) of water and fully exposed to the elements. Only after the ship is back up on her keel will it be possible to inspect it fully and begin to plan the next stage - the effort to repair and re-float it and eventually tow it away to be destroyed. The head of the operation, Nick Sloane, told the AFP news agency that it was now or never for the Costa Concordia, because the hull was gradually weakening and might not survive another winter. There are also concerns that filthy water trapped in the rotting, rusting wreck will pour out as the ship rises. But booms and nets have been put in place to try to combat any pollution threat in what is a marine national park. Five people have been convicted of manslaughter over the disaster, and the captain, Francesco Schettino, is currently on trial accused of manslaughter and abandoning ship. Giglio mayor Sergio Ortelli said that the removal of the Costa Concordia would bring an end to "a huge problem that we have in our port and that we want to solve as soon as we can". "Islanders can't wait to see the back of it," he said. On Sunday, prayers for the operation were said during Sunday Mass on the island. The small island's economy depends hugely on tourism and the presence of the wreck has discouraged visitors. The salvage project has so far cost more than 600m euros ($800m; £500m) and is expected to cost much more before the operation is complete.